In these days of large file sizes, sending an e-mail with an attachment can become a gripping drama. Will the e-mail with the attached file get through, or will your e-mail service--or the receiving e-mail service--reject the file as too big? And will either of them deign to tell you? Can a program like WinZip Courier ($25, 30-day free trial) save the day? WinZip Courier lets you customize the level of compression to use when zipping files to send via e-mail. WinZip Courier can't guarantee you'll be spared this soap opera, but it can go a long way toward helping. It integrates into Microsoft Outlook and lets you compress attachments using the WinZip standard with a single click of a button. In fact, once you install the program, every attachment will be zipped unless you click the button each time to tell WinZip Courier not to zip it. After you do that, just send your e-mail as you would normally. The recipient will get the files zipped together, and can unzip them either using Windows built-in unzipping capabilities, or add-on software like WinZip. This Outlook plug-in does more as well. WinZip Courier also can encrypt your zipped attachments so that only someone who has the encryption key can open it and read it. You will have to let the recipient know the encryption key--and each time you zip a file, it's a different key. So you'll have to find some way to arrange letting recipients know the keys if you're going to use encryption. In addition, it integrates into Microsoft Word, Excel, and PowerPoint so that you can zip any file you're working on right in the program, and send them via e-mail as well. WinZip Courier offers plenty of options, including setting the compression level of zipped files, and the encryption level for encrypted files. You can also either have it either encrypt every file by default, or else only encrypt those you specifically choose. .
All that is useful, but is it worth the $25 registration fee? 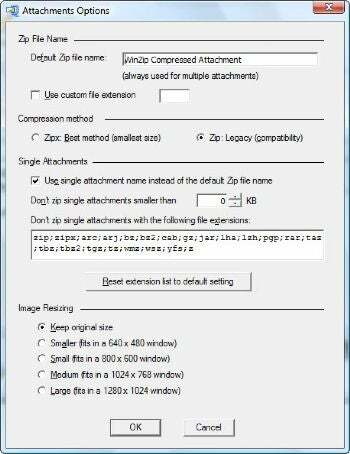 There's a workaround in Outlook for compressing a group of attachments in the Zip format without having to use WinZip Courier: When you click the Attach File button, select the files you want to send, right-click them, select Send To...Compressed (zipped) Folder, and then select that zipped file instead of the highlighted files as an attachments. That's a kludge, but it does the job. On the other hand, this Outlook trick doesn't offer encryption, nor does it integrate into Word, Excel, or PowerPoint. The upshot? If you send a lot files you want to compress, and would like extra options for doing so, WinZip Courier might well be worth paying for. Note: The software will install a demo version of the Uniblue RegistryBooster 2 program on your PC by default. If you don't want it installed, during the installation process select "No thanks, just install WinZip."